"Coaching For The Zone" is available in print and eBook formats. Coaching is all about improving performance. Coaching is not remedial. In sport, improvement can often be quite obvious and tangible (times run, distances thrown, points scored). But, outside sport, there may be dozens of other measures that people will be working to improve on. Some of these will be hard edged measures; e.g. in an organisation they may be based on performance appraisals, return on investment, cost-benefit analyses, 360º feedback, more effective recruitment, better retention of people, greater productivity, results of projects. For individuals outside organisations they may include: better health, greater fitness, better relationships, more success either at work or in carrying out a hobby. The measures for these and the evidence for being in the Zone will be agreed between the coach and the coachee. The Zone is a mental performance state, where you don’t have to think about what you are doing. It is characterised by total absorption in an activity, where skills execute totally naturally. Interestingly, people get so absorbed in the moment, that they often do not realise they are in the Zone, at the time. It is based upon being on automatic pilot and going ‘beyond’ whatever one thought possible previously. The Zone is relevant for a number of reasons, one of which is the added dimension it gives to people’s lives. Even though they may not use the word ‘Zone’, people often describe transcendent, life changing, or life affirming experiences that relate to the Zone. From my experience, as a practitioner, the Zone is a universal state, and can apply across all individuals and all contexts. Why would someone want to enter the Zone? The Zone is a transformational process that enables people to perform to a higher ability and standard. As mentioned above, the best known application is within sport; athletes talk about being ‘in the Zone’ at the point of either winning or achieving results that they have never achieved before. What about people who are not sportsmen and sportswomen? What about the account manager or the widget company salesman? One of the great things about the Zone is that it is a life process, in that you can be anything – businesswoman, doctor, gardener, pianist – anybody in any walk of life can benefit from learning to enter the Zone state. Some people will argue that because some aspects of the Zone are elusive, and difficult to pin down (such as effortless ease or automatic pilot) it is not possible to coach it. In my experience, this is not the case as everyone I have worked with has experienced the Zone but often without realising it, or in a different context or situation to the one they are now trying to work on. The power of this is that if they have had the experience, whatever the context, the door is open to achieving it again. But, on a practical level, what will the Zone actually do for people? The Zone will help take performance beyond what has been achieved before. For example, if giving a presentation is required, but the presenter is terribly nervous, entering the Zone state means that they will be able to perform more effectively. In turn, the Zone can help people become more creative, develop better work relationships, improve their performance, increase skills or confidence. A teacher (a friend of mine) was having difficulties with her class and with one individual in particular who was the ring leader for the whole class. This individual was rude, aggressive and confrontational and my friend was at her wits’ end as to how to deal with him. Finally she achieved a breakthrough with the boy not by trying to force or dominate him but by using humour. Humour that did not just laugh with him, or at him, but which operated in a purposeful direction. The significance of this is that it was done on the spur of the moment not preordained. When discussing this afterwards she said that had she pre-thought her actions, she would not have felt she had the skill or the confidence to do as she did. Therefore she would not have attempted it. The teacher said she had heard of the Zone, without understanding what it was, but when she described how she felt while achieving this breakthrough in class, she was describing the Zone beautifully. She responded automatically without conscious thought, trusting her intuition, prepared to trust her skills and instincts in order to respond effectively to the situation. I was working with a professional cricketer (he was struggling for performance at the time of our sessions) who had experienced being in the Zone many times within his sport. Then he paused, and began to recount an occasion when he was best man at a wedding and had to stand up and give a speech to 400 people. Something that, frankly, made him extremely nervous. Five minutes into the speech, he was totally in-synch with the event. He could look around, see faces, was aware of the power of his voice. He was, in fact, in the Zone. The two examples above, illustrate how the Zone can operate without an individual knowing it, or – when someone is trained in the Zone – in other/different parts of their lives. I was coach to a businessman who had a total fear of presentations. Although a very successful senior manager he avoided giving presentations to the point where it became obvious and visible to other people. Through coaching it became apparent that he was more worried about things going wrong than positive about the benefits of getting it right. Through a combination of techniques covered in this book, anchoring, visualisation, belief changes, his mindset was changed from getting it right for himself to getting it right for his audience. He learned how to utilise the Zone. This change was huge for him as it enabled him to liberate himself and push and extend his comfort zones way beyond anything he had ever imagined. One other added benefit to this was that he realised that this change of attention was powerful in all aspects of his everyday life, both at home and at work. Although he had always considered himself a good people manager this ability to pay more attention, on a deeper level, to other people reaped dividends outside the narrow field of giving presentations. So, how easy is it (for a coachee) to learn the Zone? People often look for a quick fix to their problems, but learning the Zone requires repetition and it requires practice. In a nutshell, it requires a commitment. 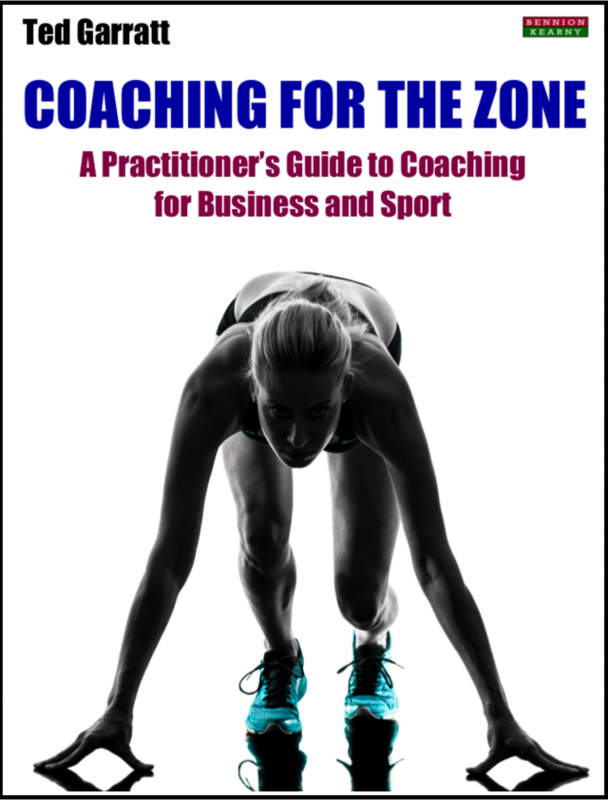 This book is about coaching the Zone; does that mean enabling coachees to enter the Zone more easily? Yes, but not just more easily – more regularly too. Often, people report that they believe they entered the Zone spontaneously during a presentation or meeting or activity. The aim of this book is to enable coaches to train coachees to enter the Zone on demand. How easy is it to coach for the Zone? From the coach’s perspective? It is incredibly easy, with the right preparation. But preparation is key! How many sessions are normally required for a coaching for the Zone programme? Hah! How long is a piece of string? Some people will get it very quickly. One of the reasons for this is that many people (without necessarily realising it) will have had experience of the Zone previously, and this will come out during discussions. Normally, I find anything from three to nine sessions is applicable. Frequency is a related issue to the number of sessions. In sport, for example, the coach might have regular contact with the coachee (weekly maybe) whilst in the business environment the frequency might be monthly or six-weekly. High frequency will shorten the process though not necessarily the number of sessions. Often I find that coachees (between the first and second, or second and third session) will come back and say “I had this experience in this meeting / at this presentation / with this client – and I think that was the Zone because…” This can then affect the number of sessions, and their content. Do coachees need the Zone to solve particular problems, or do they need the Zone to expand their abilities? It is a bit of both. A lot will depend on the job and the context. Some people will be extremely specific and it is about improving their job performance – in the here and now – in a measured way. They will want to demonstrate to themselves, and maybe their managers, the success that has been achieved. Other people will find the Zone slightly more ‘peripheral’. These folks are looking to gain different skills and different attitudes, and a trust in the process will enable them to apply the Zone when required. The main audience for this book is obviously coaches; irrespective of the context in which their coaching takes place. The purpose of this book is to help managers, coaches, coachees and potential coaches to achieve new levels of performance by accessing the Zone on a more consistent basis. Therefore, making best use of the book will depend to large extent on the interests of the reader. One way to use the book would be to go straight to the activities parts of each section. However, conducting the activities without understanding the context or being able to respond to the coachee’s real requirements can be inappropriate and even potentially damaging. The first part of this book centres around a coaching program with ‘Alan’. The sessions with Alan provide a framework for the rest of the book in that most of the sessions include a description of a situation that Alan is facing, how the situation is dealt with, a sample dialogue between Alan and the coach, a case study from sport, and one or more activities to use to improve the coaches skills. One of the anomalies of the Zone is that although it can be difficult to describe it can be achieved on a regular basis by the coach using a wide range of key skills. What is even more powerful and helpful is that these key skills are not magical or mysterious but are actually the same skills that people use all the time in their everyday lives. It’s in the application of these skills that the skill of the coach comes into play – providing ‘the difference that makes the difference’. So the purpose of the key skills section is to offer a set of skills that the coach can use with their coachees, and also use to develop their own effectiveness. Skills such as questioning, giving and receiving feedback, using intuition, dealing with self-limiting beliefs, and more, are covered in a similar way to the sessions with Alan. Let’s begin!